This is an open letter to Jamaica Plain by a resident of that neighborhood, Helen Matthews. The people of Jamaica Plain are currently grappling with a proposal to replace an affordable independent grocery store with a Whole Foods. Ms. Matthews asks her neighbors to stand with her against the new grocery store. Photo from Whose Foods / Whose Community? The Coalition Against Gentrification facebook page. I have been listening deeply to the heated controversy incited by the news that Whole Foods’ plans to open a new store in Hyde Square, the Latin Quarter of our neighborhood. The lively debate of the past few weeks has inspired me to learn more, to research more, and to better understand the extent to which the arrival of a Whole Foods Market should be expected to contribute to gentrification in Jamaica Plain. What I’ve learned is that for years journalists, real-estate agents, developers, and city planning consultants around the country have been discussing a phenomenon called “The Whole Foods Effect.” It refers to the impact of a Whole Foods store on the value of surrounding real-estate and its magnet-like tendency to draw other upscale stores. Even a 2007 study in Portland, Oregon found that property values typically go up by about 17.5 percent if you live nearby a Whole Foods. But out of all of the communities hit by the Whole Foods Effect, the Ward 2 neighborhood in Washington, D.C. is interestingly analogous to Boston’s Latin Quarter. Ten years ago, at the turn of the century, D.C.’s Ward 2 went through a similar grocery store turnover during a major shift in its population and income. The parallels portend the risks that Hyde Square faces in welcoming a Whole Foods Market. First of all, when the P Street Whole Foods opened in Ward 2, it replaced a more affordable grocery store (across the street). Hyde Square’s affordable grocery store, Hi-Lo (arguably the most affordable grocer in Jamaica Plain), is set to be replaced by Whole Foods. So, in both communities, we see the transformation of an accessible grocery store to an upscale one. Secondly, both neighborhoods were inhabited primarily by people of color and then saw these populations leave in large numbers during the ten years prior to catching the attention of Whole Foods. In the decade prior to Whole Foods’ new P Street store in Ward 2, the neighborhood’s African American population had declined by 23 percent. [also according to “The Impact of Whole Foods,” attached.] In Hyde Square, the percentage of residents of Latin American descent has declined 26 percent from 2000 to 2009, according to the Census Bureau’s American Community Survey. Thirdly, as the racial makeup changed in each area, so did the income levels. The Jamaica Plain neighborhood experienced a roughly 20 percent increase in income in the last ten years, as did Ward 2 before the arrival of Whole Foods, according to Onboard LLC. These similarities give us reason to look closely at what happened in Ward 2. There, the arrival of Whole Foods was the “watershed event” in the neighborhood’s gentrification. Clearly, it didn’t start the process, but it did cause its acceleration. It “made a statement that this was going to be an area for wealthier shoppers,” according to a Whole Foods impact study. The P Street study concluded, “the appearance of Whole Foods has dramatically increased the speed of gentrification in the area” – beyond the speed of grassroots checks and balances. Renters beholden to the private market are also displaced, not by “cashing out”, but by being priced out. So the face of a neighborhood changes as the door is shut and locked behind them, likely much quicker if you add The Whole Foods Effect. Does Hyde Square want to live through the Whole Foods Effect much like Ward 2? What does Hyde Square want to look like in 10 years? As the shadow of Whole Foods blankets Boston’s Latin Quarter, the corporation is seeing something they’ve probably never seen before – a very large and well-organized group of neighbors rising out of their armchairs, shutting their laptops, sweeping up their children and gathering at public rallies and forums, demanding an affordable and diverse Jamaica Plain without Whole Foods. They’ve launched a campaign called “Whose Foods?”, collected hundreds of petition signatures, spoken out to the Neighborhood Council, produced four videos, garnered the attention of major papers and blogs, gathered over 400 Facebook fans, written letters-to-editors, and created a bilingual Web site that even nay-sayers are calling “very slick” — all in a handful of weeks. I imagine that Whole Foods assumed Hyde Square would give ground in much the same way as Ward 2. But Jamaica Plainers are unusual – not only have residents here successfully kept out Dominos, Jack-in-the-Box, K-Mart, and a state highway, but there are also some truly meaningful and rich ties between neighbors across race and class that have quickly woven a network of resistance. This is the Jamaica Plain Effect – the impact of a powerful, loving, grassroots community taking ownership of itself. I stand with everyone who is opposed to a Whole Foods in Hyde Square. With hope and faith, I ask my neighbors to join me. ﻿CoLab Radio received this letter in an email forwarded to the MIT Department of Urban Studies and Planing email list by Mel King, a long-time Boston activist and founder of the MIT Mel King Community Fellows Program, and republished it in collaboration with Helen Matthews. CoLab Radio is a platform for the voices of those engaged in improving communities. This site does not endorse any particular view point or ideology. Rather, CoLab Radio endorses the proliferation of ideas related to Urban Planning. Aside from the debate over the grocery store itself, this post brings to mind an important question. What should be gentrifiers role in debates over gentrification? Most of the community reading the CoLab blog probably fit into the category of well educated professionals. We move to neighborhoods like this. We affect the local retail and real estate values. And, we complain about gentrification with the assumption that the flood of “others” that will come and ruin the neighborhood is substantially different from ourselves. This requires serious self-reflection. How is gentrification different from other neighborhood change? Sudden change certainly has severe consequences. If it is instead a gradual process, is it OK? Hyde Square has changed many times. It was not built as a Dominican neighborhood, but became a center for that community over time. (It is also not now nor has ever been “Boston’s Latin quarter.” Go see East Boston, East Somerville, and Villa Victoria for instance). Hyde Square and surrounding parts of JP and Roxbury have also seen socio-economic changes towards cheaper and more expensive over time. What is the real problem right now? What are the other issues impacting the neighborhood, and is this the right fight? 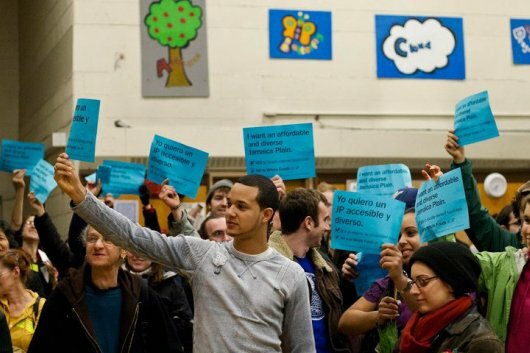 Will stopping Whole Foods save the neighborhood, or would stopping Boston Public Schools’ plan to shutter schools in the neighborhood be a more important victory? What about supporting the Hyde Square Task Force, JPNDC, and Urban Edge in their successful efforts to empower low-income people in the community? Can constructive efforts like theirs provide the right counter balance to gentrifying forces? Whole Foods supplanting Hi-Lo is a very symbolic fight. It is an easy one to publicize and join. It may be the right one, and maybe it will galvanize people to take up other important tasks. But this community needs to ask ourselves these questions as we join the battle. I live in Jamaica Plain, although not close enough to Hi Lo (which will now possibly be Whole Foods) to count it as my grocery store. From 2003 – 2005 I lived a similar to the P Street Whole Foods Helen researched for this letter. I though the similarities were fascinating. James – interesting point on JPNDC and the other affordable housing developers. As far as I know, there was no significant presence of affordable developers near P Street. Personally, I find the idea of displacement and gentrification to be irksome. I hate the thought, for anyone, anywhere. So I hate it for JP too. That, and I’d rather walk down that street and see Hi Lo than a Whole Foods and the kind of cute stores that will inevitably come with it. “The Whole Foods Effect” — property values going up as a result of one moving in — seems logical when a perceived asset comes to your neighborhood. And we can argue the merits of that perceived asset for and against and collectively organize to try and keep them out. But the perspective from Roxbury is informed by a very different reality. Recently, Mayor Thomoas Menino made completing the old Ferdinand building in Dudley Square, with its neo baroque façade, a development priority. This building has been a stain on development efforts to revitalize the square for decades and is a metaphor for the (lack of ) progress in the development of neighborhoods of color. To be sure, developing this blighted site will increase property values in and around Dudley Square. Is gentrification a concern? Absolutely! So imperative, our political leadership was criticized because such development would gentrify the area. Imagine needing a grocery store in your neighborhood because you only have one and having to choose between that need and harmful impact to your neighbors. But the alternative of leaving this site blighted, fallow and unproductive is a far greater wound to inflict on people of color in this city and the neighborhoods they live in! These people, our neighbors, and the place they call home deserve better! Protecting JP, Roxbury and other urban neighborhoods of color from the forces of gentrification is not about saying “no” to development, or “no” to Whole Foods, or companies like it from moving in. To battle gentrification, we need to make sure that neighborhoods of color can participate and afford to make the choice to patronize, or not. If we can achieve that, we’ll have addressed far more than band-aid measures to address symptoms, like gentrification, that only reveal we aren’t building social capital the way we should be, which is why neighborhoods of color are at risk in the first place. The larger problem is one of economic mobility and development. Band-aid measures aside, we must address poverty and raise the standard of living. Dare we ask: what’s so terrible about elevating folks who cannot afford, to a place where they can afford? Nothing! It’s what built the middle class. Economic mobility does not start with keeping Whole Foods out of JP. Rather, it starts with: graduating everybody from Boston Public Schools; adopting educational practices and norms that close the achievement gap and provide real opportunities to our kids after graduation; better focus on math and science to make our kids more competitive with the rest of the world; fairer approaches to awarding construction jobs and contracts when the city develops in neighborhoods of color; better utilization of potential retail space in neighborhoods of color; and finally creating a vision of not just how we can share the economic pie, but expand it. So the question really isn’t about solidarity when it comes to keeping Whole Foods out of JP. People of color, like all people, are better served when they have a stake in Whole Foods or any other improvement that comes to their neighborhood. The same kind of stake that provides economic mobility, stability, growth and development that occurs in other neighborhoods with fewer people of color. Why should the stakes be different? In the end, it’s more about, have we identified the right enemy and battle? Truly, aren’t people of color worth picking the battle wisely? Rather than folks in JP asking Roxbury to join with them in keeping Whole Foods out, a more compelling question is: Will you stand with us?